Enjoy breathtaking views of the Otways and the Bass Strait in this elegantly furnished and well equipped modern and stylish house, located in a quite seaside haven of Apollo Bay. This spacious 2 level four bedroom, 2 bathroom home is ideally located some two hundred meters from the beach and a short stroll to the shops and cafes. It has two spacious balconies, one facing the mountains and the other facing the sea. These balconies provide a wonderful outdoor entertaining area that offers the opportunity for loads of relaxed family holiday fun. On one of the two balconies, the larger of the two, there is an eight burner Gas BBQ and a 7 piece outdoor setting whilst on the other balcony, the one that overlooks the ocean, there is a 5 piece outdoor setting. In addition to the balconies, the upper level consists of an open plan kitchen, living/ dining area. The kitchen is fully equipped with microwave, fridge, and dishwasher. It has an electric oven and electric hotplates. it also has an electric rice cooker. There is a breakfast bench with two bar stools. A plastic rectangular table with four plastic chairs. In the dining area there is a dining table with eight chairs. In the living area there is an L shaped leather lounge suite consisting of a 4 seater couch, a three seater chaise, and a click-clack, a 46 inch LCD Full HDTV, BlueRay, CD and reverse cycle air con. The master bedroom (bedroom 1) is also on the upper level and has great views of the ocean. You could lay in your bed and enjoy the views of the magnificent and mysterious Bass Strait. It has an en suite (shower, vanity and toilet), and a walk-in wardrobe. On the ground level there are three bedrooms, bathroom, separate toilet room and laundry. The Bathroom has a Spa bath, separate shower and vanity. The Toilet room has a toilet and vanity. The Laundry has washing machine, clothes drier, Ironing board and Iron. There is also a clothes line outside. The First Bedroom (bedroom2) has two windows with one having views of the mountains and the other having views of the sea. It has a queen size bed. The Second Bedroom (bedroom3) Has a large window with angled views of the sea. It is also equipped with a 19 inch HDTV and DVD player. It has a queen size bed. The Third Bedroom (bedroom4) is normally a kids room and has direct access to a small undercover deck. It has a tri-bunk. Master Bedroom (Bedroom 1): Queen size bed with doona and pillows. Bedroom 2: Queen size bed with doona and pillows. Bedroom 3: Queen size bed, with doonas and pillows. Bedroom 4: Tri bunk, single on top, double underneath with Doonas and pillows. * Linen is not is not included however, should you require linen (Pillow covers, sheets and towels) it may be able to be arranged for a small additional charge. Should there at anytime, be more persons at the house than the number of persons approved, the additional persons charge will apply. * The Apollo Beach hose is a smoke free house. No smoking is permitted inside the house however smoking is permitted on the balconies and lower deck. Should you cancel your booking within 30 days of the check in date, you will forfeit all money paid. Should you cancel at any time before the 30 days of commencing your stay, you will forfeit your deposit or 50% of all money paid, which ever is the greatest. * A BOND OF $300 IS REQUIRED FOR ALL EXCEPT FOR SCHOOLIES. THE BOND FOR SCHOOLIES IS $1000. * NO PETS ARE PERMITTED ANYWHERE AT THE PROPERTY. * NO SMOKING IN THE HOUSE. * NO PARTYING LATE AT NIGHT. * NO VISITORS AT THE HOUSE ARE PERMITTED WITHOUT PRIOR WRITTEN APPROVAL FROM THE HOUSE MANAGER. BREACH OF ANY OF THESE CONDITIONS MAY RESULT IN EVICTION AND OR FORFEITURE OF BOND. Reverse Cycle Airconditioner in the living area and fans in all bedrooms. Oil heaters for the bedrooms and a reverse cycle Heater/Airconditioner in the living area. parking for 2 cars. One behind the other. 3 decks. one with views of the mountains and the other with views of the ocean. An additional small deck is found on ground level. Fantastic . Very enjoyable stay. Lovely house, so close to the beach. Everything we needed for a great family holiday. Thank you. Very nice and clean house with a beautiful views, we enjoyed staying at this house and i recommend to other people that looking for a nice family house for a weekend away. 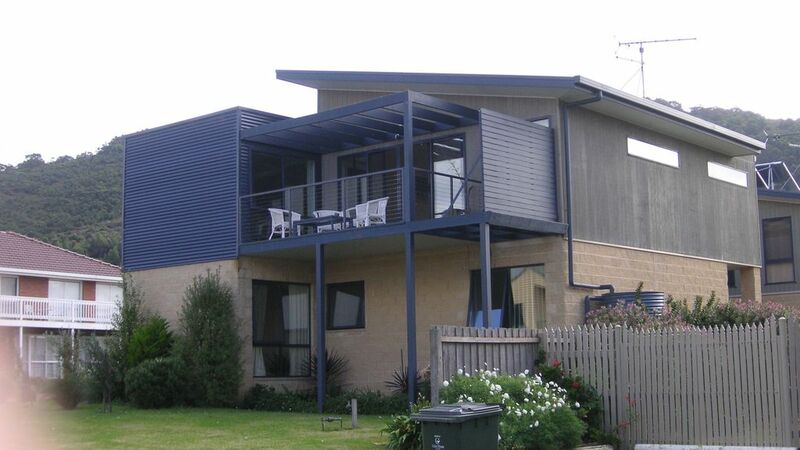 I stayed here with my husband and 2 kids as part of a road trip along the great ocean road. Beds really comfy and place was very clean. It’s a short drive to the shops for dinner etc. we didn’t use the kitchen except for breakfast so can’t comment on this aspect. Would recommend. We were part of two families and had a wonderful time. Had everything we needed and the short walk to the beach and town was delightful.